A contact period is a period of time when it is permissible for authorized athletics department staff members to make in-person, off-campus recruiting contacts and evaluations. Contact Defined: A contact is any face-to-face encounter between a prospective student-athlete or the prospective student-athlete’s relatives, guardian(s) or individual of a comparable relationship and an institutional athletics department staff member or athletics representative during which any dialogue occurs in excess of an exchange of a greeting. Any such face-to-face encounter that is prearranged (e.g., positions himself/herself in a location where contact is possible) or that takes place on the grounds of the prospective student-athlete’s educational institution or at the site of organized competition or practice involving the prospective student-athlete or the prospective student-athlete’s high school, preparatory school, two-year college or all-star team shall be considered a contact, regardless of the conversation that occurs. Any communication (e.g., face-to-face, telephone call or electronic transmission) with a prospective student-athlete at the site of organized competition involving the prospective student-athlete by athletics personnel who are attending the competition or who are aware of the competition also shall be considered a contact. An evaluation period is a period of time when it is permissible for authorized athletics department staff members to be involved in off-campus activities designed to assess the academic qualifications and playing ability of prospective student-athletes. No in-person, off-campus recruiting contacts shall be made with the prospective student-athlete during an evaluation period. Evaluation Defined: An evaluation is any off-campus activity designed to assess the academic qualifications or athletics ability of a prospective student-athlete, including any visit to a prospective student-athlete’s educational institution (during which no contact occurs) or the observation of a prospective student-athlete participating in any practice or competition at any site. A quiet period is a period of time when it is permissible to make in-person recruiting contacts only on the institution’s campus. No in-person, off-campus recruiting contacts or evaluations may be made during the quiet period. A dead period is a period of time when it is not permissible to make in-person recruiting contacts or evaluations on or off the institution’s campus or to permit official or unofficial visits by prospective student-athletes to the institution’s campus. It remains permissible, however, for an institutional staff member to write or telephone a prospective student-athlete during a dead period. Institutional staff members may receive telephone calls placed by a prospective student-athlete at the prospective student-athlete’s own expense at any time, including before July 1 following the prospective student-athlete’s junior year in high school. So please use this information to plan your fall/winter recruiting cycle. Form your plan early, then just play hard, have fun, and good luck! We’ve launched a brand new podcast to help parents and student-athletes understand the challenges, strategies, and tactics required in order to navigate the recruiting process with confidence. Introducing The Realties of College Recruiting Podcast. Each week we will tackle some of the most important questions about the college recruiting process. Hosted by former collegiate athletes, The Realities of College Recruiting Podcast will give you expert advice and insights into the world of college recruiting. When do colleges begin the recruiting process? How do you get noticed in the first place? Find out all of the answers to these questions and much more in this week’s episode! Don’t want to miss an episode? The Realities of College Recruiting podcast, brought to you by SportsForce, will tackle some of the toughest college recruiting questions. Our college recruiting experts will share their personal expertise and key insights that will help you maximize your college recruiting efforts. This is a weekly podcast that is hosted by former MLB scout for the Cleveland Indians, 2x coach of the year (Junior College) and current recruiting advisor for SportsForce, Ryan Thompson The Realities of College Recruiting podcast will bring you interviews with some of the top college coaches from around the country in order to help make your college goals a reality! Raise your game with SportsForce! Do you have an “off-season”? In the last decade or so, a number of camps, showcases, tournaments and club teams have grown exponentially. Year-round lacrosse has become the norm, even in colder weather states. This includes play for both high school programs and club teams. With this trend of the ever-expanding season, there has been an increase in a number of players either getting injured or burning out at a young age. In this regard, the volume and accessibility of events, teams, and programs aimed at aiding with development and providing exposure to college coaches has been both a blessing and a curse. With this newfound accessibility and today’s technology, more players are getting opportunities to be recruited by schools they would have previously never considered, even 10 years ago. Players can be recruited on a national level more easily, which gives student-athletes a better chance to find their best-fit college program. Players are getting more informed on the recruiting process and exposed to the different levels and divisions of college lacrosse. In general, it is easier to find a good athletic/academic/financial match than in previous years. Our “regular season” is typically where we want to be at our best, as we have a daily practice and can play a brand of lacrosse more like the college game. The challenge that we all face, as both players and coaches, revolves around the schedule. The LEAST convenient and LEAST realistic time for colleges to see you play is during your high school season. Coaches may occasionally be able to make it to a local game or to a game while on a road trip, but they are consumed with their own seasons, which puts a live evaluation on the back burner. So naturally, coaches are most actively recruiting and evaluating from late May-January. As it happens, the bulk of quality recruiting showcases and tournaments are scheduled during that period as well. The most elite professional athletes in the world have a schedule that includes stretches of time devoted to rest (not complete inactivity, but a break from the repetitive motions required to compete). It’s literally scheduled into their training plans by most professional sports teams’ training staffs. So why do so many high school lacrosse players think it’s ok to have a longer season and less rest than professionals? High school athletes are not done growing and developing. They have likely not prepared themselves physically to handle the strain they are putting on their bodies. They haven’t given their bodies any sufficient, extended period of time to heal, recover, and grow. It’s a good idea that physical and mental rest be factored into every family’s plan for their growing student-athlete. Whether it be private lessons, camps, showcases, tournaments, club teams, training programs, or other specialty events, sometimes the correct answer is no. 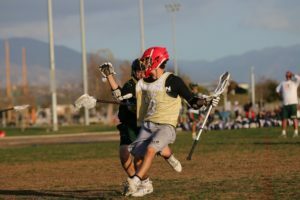 Families are dedicating increasing amounts of time and money every year hoping to find that golden ticket at the next event that gives their son a lacrosse scholarship. It is not uncommon to see high school players who never take a break from playing tournaments, high intensity camps, or other showcases for longer than a few weeks. So what is the solution? These events/teams are not going away anytime soon, and likely they will only continue to increase in number and frequency. The burden of this responsibility really lies on players and their families to make smart, responsible decisions. Each player’s calendar will likely be unique to his situation. Plan your calendar in advance for the entire year. Start with the active playing seasons (high school/club) and carefully select additional events and training as they fit in your schedule. Do not enter an event where you are expected to perform at max speed/intensity without preparing physically. Getting ready to play requires at least a week or two of cardio, agility, and flexibility workouts. Plan a few periods of consecutive (2-3 minimum) weeks of rest throughout the year. Use your down time for strength/conditioning training, stick skills, and light lacrosse activity. Get back to fundamentals and lower intensity drills aimed to maintain and develop skills/mechanics. It’s ok to say no. It is flattering to be invited or chosen to play or participate in many events. Sometimes, however, it is not necessary. Plan in advance and try to avoid spur of the moment decisions on events you are not ready for physically, mentally, or financially. PLAY MULTIPLE SPORTS! It creates a natural off-season. Even if it is recreational or you will never play in college, it gives your mind and body a break. In most cases, the skills and coordination learned in other sports translates to you being a better athlete and lacrosse player. 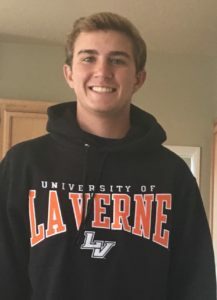 We would like to congratulate Jacob Benson on his commitment to the University of La Verne! Here are Jacob’s recruiting story and interview after his commitment. Good luck as a Leopard! 1. Please share your recruiting story and status. The recruiting process for me was about as lengthy as gets. There were a lot of ups and downs along the way, some days had me feeling doubtful and stressed out while others left me feeling like I could do no wrong. Overall, I am very satisfied with the way things worked out. I committed to La Verne in the middle of July going into my freshman year of college and I couldn’t be happier about it. I chose the University of La Verne because I felt that it suited me academically and athletically. It’s a pretty tough school to get into, and I really enjoy the fact that they have small class sizes. As for baseball, they have a really good history of winning and the coaches and facilities are one of a kind. Sportsforce really helped in the process of organizing emails and helping me give a clear path of what schools were a good fit. Along with this, they did what I needed the most, which was getting me exposed to many schools through tournaments and showcases. I would tell parents and their players to not rush the recruiting process. It’s good to be able to have a lot of options in front of you, and if you commit too early, you might be missing out on a better offer you could have had in the future. There were a lot of factors that went into choosing a school for me, so I would recommend not being too anxious to commit after receiving that first offer. Enjoy the ride, it’s a once in a lifetime experience! I’m beyond excited to get going, I always loved watching the pace and intensity of a college baseball game, and I can’t wait to finally be a part of that. I would say my family is going to save around $70,000 due to me being an athlete. If you can manage to keep good grades in high school, it really opens up a lot of opportunities to get into prestigious schools and earn more scholarships to go along with it. I would absolutely recommend Sportsforce for any high school athlete looking to play in college. I truly believe they’ve created a reliable and efficient formula to get kids recognized and exposed to whatever school they desire. I cannot thank them enough for all they have done for me! We would like to congratulate Jack Pharies on his commitment to Centre College! Here are Jack’s recruiting story and interview after his commitment. Good luck as a Colonel! 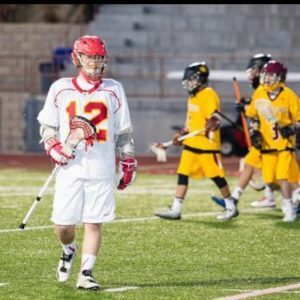 I was actively recruited by over 20 colleges to play lacrosse. I narrowed down my choices to 3 colleges by the beginning of the summer before my senior year, and I committed to a college in July before my senior year. I chose Centre College, which competes at the NCAA Division III level in the Southern Athletic Association. Centre is a national liberal arts college located in Danville, Kentucky. It was founded in 1819, has a national reputation for the quality of its academics, and is the number 1 school in the nation of any size for its travel abroad programs. I realized from the beginning that I would not make a living playing lacrosse, so my main focus has been choosing a college I would want to attend even if I did not play lacrosse. I have been interested in Centre from the beginning because of its size, the relationship between the faculty and students, and its travel abroad opportunities. Centre is among many schools that do not actively recruit in California. I contacted Centre through Sportsforce, and luckily the coach liked my video and asked me to campus. I already had offers from other colleges by the time I visited Centre, but I was just blown away by Coach Sharbaugh and Centre. Everything seemed to fit perfectly with what I wanted. The academics are great, the campus is beautiful, and the lacrosse coach is terrific and has a clear vision for the program and my role in realizing that vision. 4. How did SportsForce help in the process? Sportsforce played a critical role in my recruiting journey. The best way to put it is that Sportsforce allowed me to control the recruiting process rather than the recruiting process controlling me. Without Sportsforce, I would have to rely on being seen at a showcase as my primary recruiting tool. While showcases are important, and I was recruited by coaches who saw me at showcases, it limits the universe of potential colleges to those that attend particular showcases. Sportsforce allowed me to introduce myself to the colleges I wanted to attend, not just the ones that happened to be at this weekend’s showcase. I could target a school, use Sportsforce as a way to get noticed by the coach, and then drive the recruiting process from there. It also allowed me to get ahead of the recruiting cycle so that, at each school that gave me an offer, I was one of the first offers they gave to players in my class. This proved to be an unexpected benefit because nothing makes a coach want a player more than knowing that a competing school wants that same player. This gave me a big advantage in recruiting because it put me in the driver’s seat. Not only did Sportsforce give me the tools to control my own destiny, it guided me every step of the way. From producing my initial video to the first e-mail campaign, to campus visits, and ultimately to making my commitment, Coach Hadlock and Sportsforce have advised me, supported me, and encouraged me. First, recruiting begins with grades. One of the first question every college coach asked me was my GPA and test scores. To keep your options open, you need to keep the grades up and do well on standardized tests. Second, choose a college that you would want to attend even if you couldn’t play lacrosse. After all, every player is only one injury away from becoming a spectator. Third, get to know the coach and the lacrosse program well and make sure you share the same goals. Find out how the coach recruits – is he selective in who he recruits or does he recruit huge classes and let the Freshman fight it out when fall ball starts. What is the lacrosse team’s reputation on campus – both among other athletes and the student body at large? Do the coach and the athletic department support your academic goals? Does the team have an academic adviser who travels with the team? Will the coach support your academic goals even if they require an absence from some training (such as for study abroad if that’s important to you). Fourth, do an overnight visit. It is important to meet the team, see what it’s really like on campus, and understand the issues the current players face. 5. How excited are you on your future in college? It is the perfect school and team for me. The academic environment, with small class sizes and an exclusive focus on undergraduate education, will challenge me and allow me to reach my goal of going to law school. The lacrosse team is always competitive in its conference and I’m going to travel throughout the South during conference play. I can’t wait to experience a different part of the country. In short, I am very excited. Go, Colonels!! 6. How much money do you anticipate your family saving in college expenses? My school is NCAA Division III, so there are no athletic scholarships. However, I have been told that I will receive nearly $20,000 per year in academic scholarships. I strongly recommend Sportsforce. It provides the tools to allow the player to control the recruiting process. Most players and parents go into the recruiting process with no idea of what it entails or what to expect. All of the coaches, however, do this every year and know exactly what they are doing. This necessarily puts players at a disadvantage. Sportsforce helps to not only level the playing field with their knowledge and guidance, but they help put the player in control of that process by giving the player the tools to target schools, get noticed by the coaches, and to get ahead of the recruiting cycle.